Northwest wind gusts of 40 to 50 mph will reduce visibilities below one quarter mile in blowing and drifting snow. * WHAT...Ground blizzard. Northwest wind gusts of 40 to 50 mph will reduce visibilities below one quarter mile in blowing and drifting snow. Localized whiteout conditions expected especially in open rural areas. * WHERE...West central and northern Iowa. * WHEN...Until 6 PM CST this evening. * ADDITIONAL DETAILS...Travel will be dangerous. Widespread blowing snow will significantly reduce visibility. Strong winds could bring down tree branches and cause isolated power outages. Weak flat roof structures may be damaged by the combination of new snow and existing snowpack in areas that receive the highest snowfall totals. * WHAT...Blizzard conditions. Additional snowfall of up to an inch with increasing winds. Winds gusting as high as 50 mph. * WHERE...Portions of west central Wisconsin and south central and southeast Minnesota. * WHEN...Until 6 PM CST Sunday. * ADDITIONAL DETAILS...Travel will be very difficult with some roads becoming impassable. Areas of blowing snow could significantly reduce visibility. Gusty winds could bring down tree branches. A Blizzard Warning means severe winter weather conditions are expected or occurring. Falling and blowing snow with strong winds and poor visibilities are likely. This will lead to whiteout conditions, making travel extremely dangerous. Do not travel. If you must travel, have a winter survival kit with you. If you get stranded, stay with your vehicle. The latest road conditions for Minnesota can be found at 511mn.org and for Wisconsin at 511wi.gov, or by calling 5 1 1 in either state. * WHAT...Blizzard conditions developing. Winds gusting as high as 50 to 55 mph. 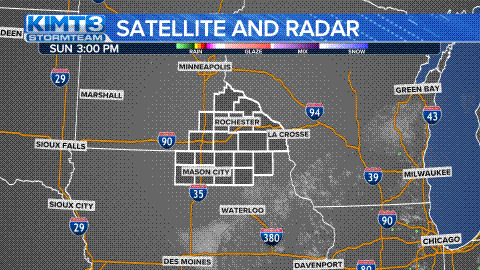 * WHERE...Portions of north central and northeast Iowa and southeast Minnesota. * ADDITIONAL DETAILS...Travel will be difficult to impossible, with road closures likely. Widespread blowing snow will significantly reduce visibility. White-out conditions at times. Strong winds could bring down tree branches. A Blizzard Warning means severe winter weather conditions are expected or occurring. Falling and blowing snow with strong winds and poor visibilities are likely. This will lead to whiteout conditions, making travel extremely dangerous. Do not travel. If you must travel, have a winter survival kit with you. If you get stranded, stay with your vehicle. The latest road conditions for Iowa can be found on-line at 511ia.org, in Minnesota at 511mn.org, and in Wisconsin at 511wi.gov or by calling 5 1 1. Tracking the weekend: At least it's not a blizzard, right?